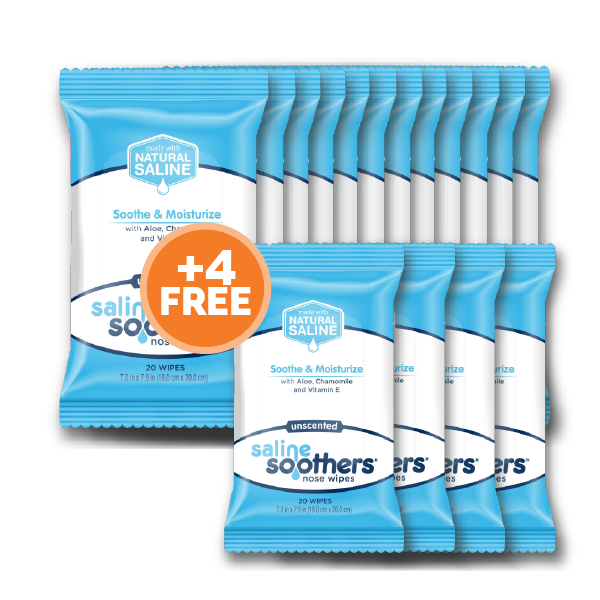 6 packs plus 2 FREE PACKS of Saline Soothers® for just $14.98 plus shipping. 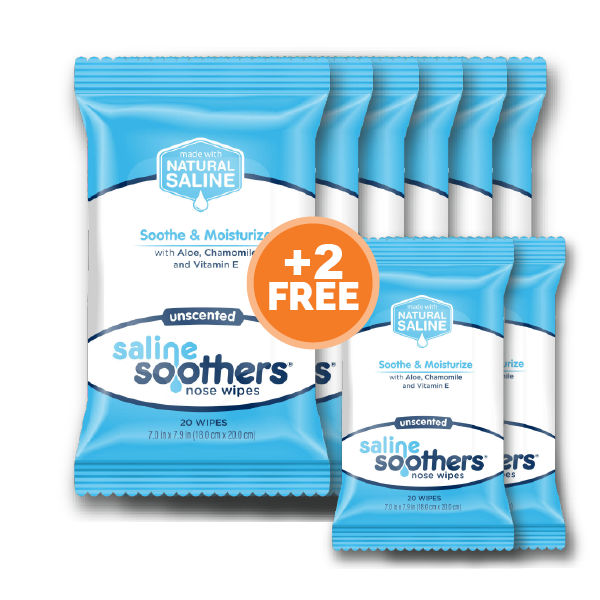 6 packs of Saline Soothers® for just $14.98 plus shipping. Get two free packs for a total of 160 wipes! Instant clean feeling with soothing relief for my nose when I have a cold. They are great for everyday uses too -- my favorite is taking off make up! My nose is so dry and raw--these feel soothing and amazing. The moisturizing component helps to heal! These are wonderfully convenient to have on hand any time allergies or even a cold strikes, they help soothe my noose with cooling, moisturizing, wipes that help ease my sinuses. These sheets are the perfect size and strong enough to withstand my everyday needs. It's super gentle on our noses and really helped my red nose feel better after all the tissues I used. I am so glad I found Saline Soothers! I've always saline nose spray but was so excited when I heard they put it in a wipe too! 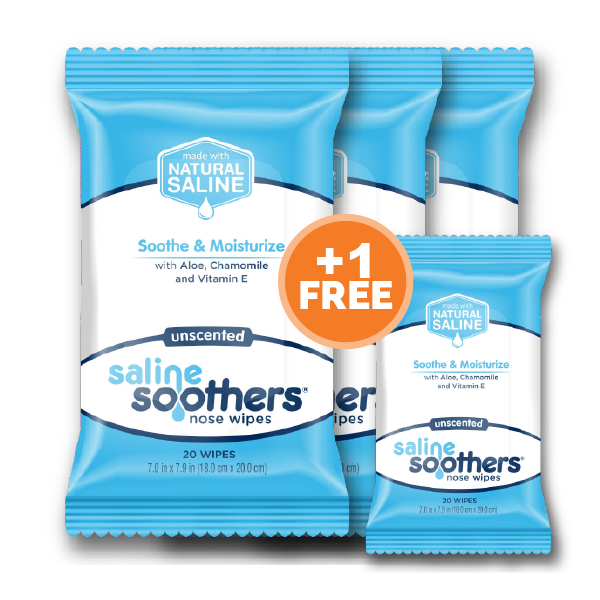 Wiping my nose with Saline Soothers is so much better than a dry tissue too. I have them in my car, purse and pretty much every room in my house! When you blow constantly, it hurts to keep blowing. These help keep your nose moist, and it is more comfortable to keep blowing! Soothing, soft and unscented. Worked well on sore nose but felt they were a little too wet to use as "tissue". Definitely soothed the chapped nose. The thickness and softness of these nose wipes provide the gentle soothing touch to even the most sore nose! I love that they are unscented AND alcohol free. It was very gentle on my nose. I loved how convenisnt and effective they were. They're also very gentle. So soft and nice scent. No sticky residue. Not itchy. They are an amazing,natural way to soothe your cold. My 13th month old was sick with a head cold and the end of last week and the beginning of this week. He had a ton of drainage from his nose,so we used the whole package of these! I really liked that they were larger than other nose wipes we have used in the past,they are also thicker and softer. The thickness was great to get all the snot,and it also helped that they were soft.Being a wet wipe is not the same as being soothing. My son did not flinch or wince once when I used these. He did however complain and fight me anytime I tried to use a regular tissue,or a different brand of wet saline wipes. I love how soft they are and they don't rub my nose raw. I love Saline Soothers. They are very soft on my nose and will help get me through cold and allergies. I don't have to worry about those scratchy tissues that leave me with a red nose. 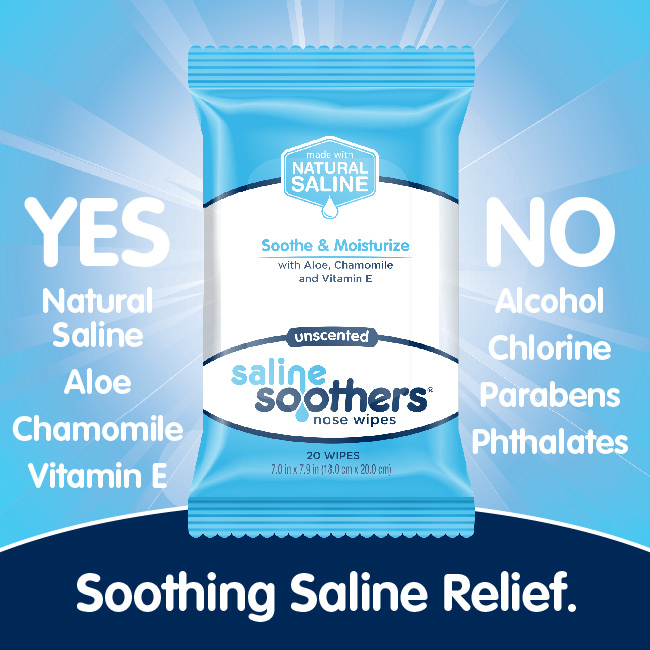 The saline in the nose wipes not only help the outside of my nose from being dry and sore from wiping and blowing but they also help clean my nasal passages. I use something similar for the kids and glad to have something for us adults to use. I think a moisturized wipe works best to not dry out your nose even more as it is already so irritated from all the sniffling and sneezing. These are perfect to wipe children's noses gently. I did not have a battle to wipe my little guys runny nose. Gentle on sensitive noses,work very well and leave nose with a very clean and fresh feeling. I like how soft and soothing they are. They also leave my nose feeling cleaner. it's nice to know that after wiping my nose with Saline Soothers,it is unlikely that some hangers on got left behind. It isn't rough on my nose! Left my nose feeling very soothing without pain. No burning or discomfort and my nose felt clean and crust free. Instant relief! Softest product out there with absolutely no irritation. Wiping my nose with a wet wipe was strange at first but now I love it - it's much more gentle and healing than regular tissues.